Snrky: Does this mean we're headed over the technical cliff? Does this mean we're headed over the technical cliff? We keep saying we generally avoid politics here at snrky.com, but sometimes the material is just too much fun to play with. 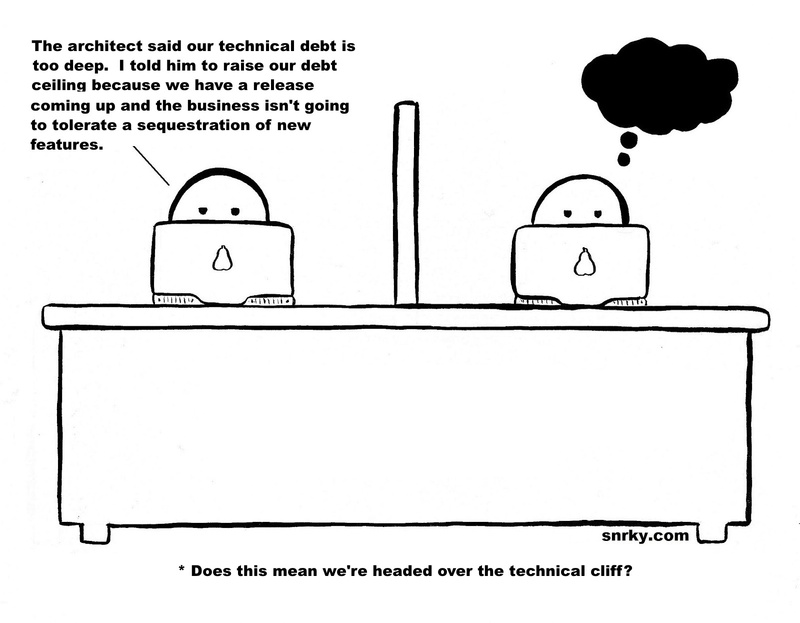 Like actual money debt, technical debt is not necessarily a bad thing, it's just a reality in the business of writing software -- sometimes you have to incur some technical debt in order to move things forward. Of course it'd be great to know everything all of the time and implement the perfect solution on the ideal timeline exactly on budget, but that is not reality. And again, like actual money debt, the problems start when you have too much of it. If you don't figure out a way to stay ahead of it things go bad quickly which is why it's important to pay attention to it when you're building software. Technical debt is going to exist, you just have to make sure you have the foresight to manage it properly. Title: Does this mean we're headed over the technical cliff? Snarky: The architect said our technical debt is too deep. I told him to raise our debt ceiling because we have a release coming up and the business isn't going to tolerate a sequestration of new features.